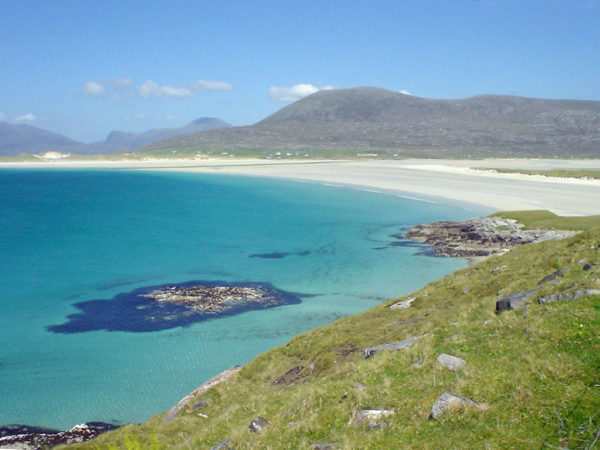 The Outer Hebrides are a group of islands, also referred to as an ‘island chain’ just off the west coast of Scotland. They form part of the Hebrides, separated from the mainland by the Inner Hebrides. They consist of a large number of small islands, namely Lewis, Harris, North Uist and Benbecula. 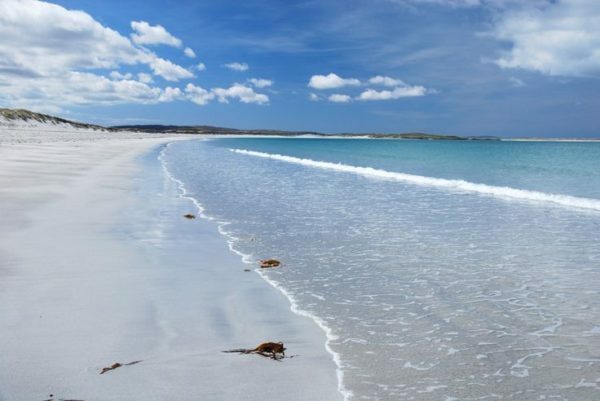 As a breathtaking part of Scotland and famous for boasting the most amazing beaches in the country, the Outer Hebrides welcome thousands of visitors each year eager to experience the very best of what Scotland has to offer. 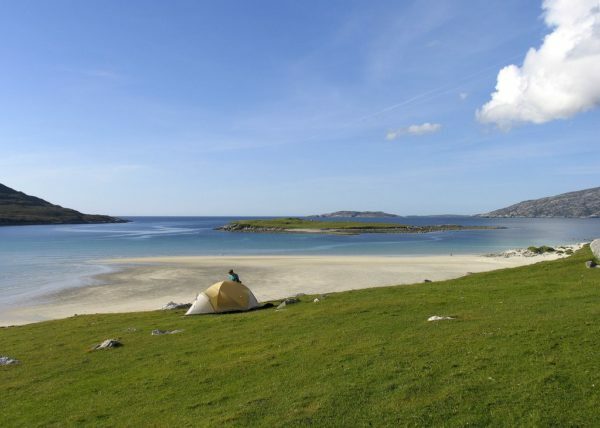 When the sun shines, Luskentyre, on Harris Island takes its place among the most beautiful beaches in the country, and perhaps, the world. The sea is light green and crystal clear. On a good day, with its water and expanse of soft, velvety sand, it may even be mistaken for a Caribbean island. To add to this, the beach is situated just in front of a stunning mountain range, creating the perfect spot for a day spent by the sea. Scarista beach is another awe-invoking beauty in this amazing part of the country. The colours created by sea and sand are just as impressive as those of Luskentyre, and the 3 miles of beach are filled with a huge variety of shells and driftwood. 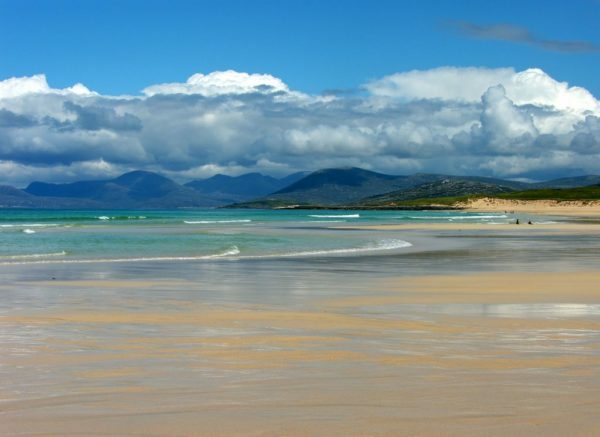 The bay isn’t as sheltered as it is in Luskentyre, and the openness means that the beach is often hit with winds and waves from the Atlantic, making Scarista a prime destination for surfers. Traigh Mheilein is a beach that lies west of Luskentyre. It’s known for its peace and tranquillity, due to the fact that it is only accessible by walking and climbing. You take a long and beautiful path to reach the sea, with wonderful views and stunning scenery. The clear blue water and fine, white sand will take your breath away while the calm and quiet of the beach and its surroundings should really make an impression. Hornais is a long and wide beach on the little island of North Uist. The background consists of a large expanse of wild and colourful flowers just bursting out of the ground. You’ll be stunned by the tropical-like, clear blue waters and bright white sand right the way along, backed by large dunes. Often, if you look for long enough, you might see a dolphin or a seal swimming in the beautiful sea somewhere near the shore.